The Sweet Scent Of Indulgence! Chuy Bubble Gum Air Freshener & Odor Eliminator captures the scent all things delicious and fun! As a kid, was there anything better than opening up a piece of gum, chewing it up, and blowing the biggest bubble you could? Did you ride your bike to the corner store to pick up your favorite pack of gum, or did you buy it from the ice cream man? Whether you were a fan of Bazooka®, Dubble Bubble®, Bubblicious®, HubbaBubba®, or Big League Chew®, this scent will surely take you back to your childhood. Indulge your sweet tooth every day with Chemical Guys Chuy Bubble Gum Scent Air Freshener! Chuy Bubble Gum Scent smells like mouth-watering bubble gum. In a blind smell test, 10 out of 10 people correctly identified the bubble gum scent! Don't believe it? Try it for yourself! Scratch the logo to smell the scent through your screen! It 's nostalgia in every spray! The sweet scent of Chuy Bubble Gum Scent Air Freshener will fill your car with the familiar scent of simpler and carefree times as it satisfies your sweet tooth! One spray is all you need for a nostalgic trip down memory lane. Chuy Bubble Gum Scent Air Freshener removes nasty odors using an advanced odor neutralizer. Easily eliminate food, body, and pet odors from any car, truck, or RV. Great for household and hotel use. Enjoy Chemical Guys Chuy Bubble Gum Scent Air Freshener thoroughly, and often! One spray is all you need for a full size vehicle. We engineered Chuy Bubble Gum Scent with active odor eliminators and neutralizers to rapidly subdue undesirable smells right at the source. Chuy titillates the senses with the delicious, mouth-watering scent of bubble gum! Chuy Bubble Gum scent is the best parts of your childhood! Chuy is enriched with sweet pink overtones, delivering a fresh scent that lasts weeks, not days. Enjoy the nostalgic scent of yesteryear with Chemical Guys Chuy Bubble Gum Scent Premium Air Freshener & Odor Eliminator. We engineered Chuy Air Freshener with active odor eliminators and neutralizers to rapidly subdue undesirable smells right at the source. Chuy Bubble Gum Scent Air Freshener & Odor Eliminator pleases the senses with the sweet and savory scent of pink bubble gum! Chuy is the perfect scent for a walk (or drive) down memory lane! One spray is all you need for a full size vehicle. Enjoy the nostalgic scent of childhood with Chemical Guys Chuy Bubble Gum Scent Air Freshener & Odor Eliminator. This bottled scent may cause flashbacks to your early childhood: Blowing the biggest bubble you could seemed like a good idea at the time… until it popped all over your face and hair! Vivid memories of romps through the park, ball games, skating down the avenue, and sneaking into movies may distract you from day-to-day activities, and make you a less productive member of society. User discretion advised. This Air Freshener & Odor Eliminator is used by professionals, automakers, OEMs, hotels, hospitality, management companies, homeowners, auto detailers, auto dealerships, janitorial companies and house cleaners worldwide. Professionals understand the importance of the proper smell in its intended environment, hence supplying their customers with a true new scent that lasts is why they turn to Chemical Guys Professional Products. 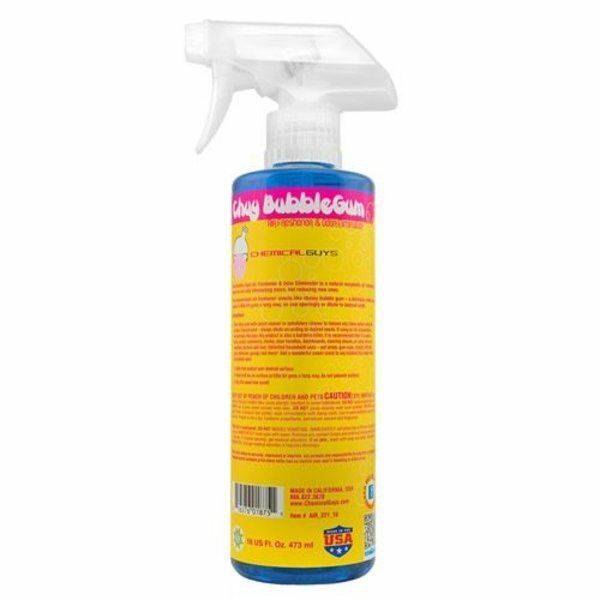 Chuy Bubble Gum Premium Scent Air Freshener & Odor Eliminator is available in 4 ounce and 16 ounce sizes.